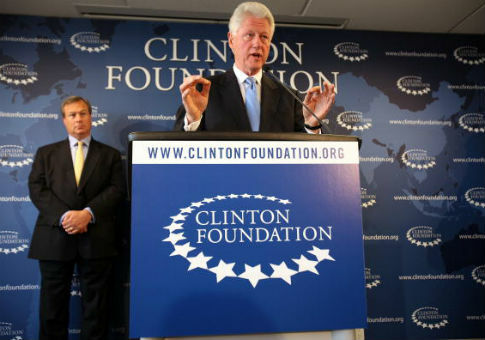 VIP packages for the Clinton Foundation's upcoming gala are going for $100,000, as the controversial charity appears ready to reemerge after laying low following the 2016 presidential election. The event, set to take place in New York City on May 24, is offering premium packages for up to $100,000, which include a table of 10 and "invitations to the Clinton Foundation Annual Briefing," Page Six reported Thursday. Tickets to the glitzy benefit—which will feature musicians Shaggy and Sting, who have recorded a reggae album together—start at $2,500. Axios first obtained a copy of the invitation, which features photos of Bill, Hillary, and Chelsea Clinton. The gala is set to occur after the Clinton Global Initiative, a branch of the foundation that had hosted an annual conference of prominent leaders, laid off 22 employees last year. The initiative was also shut down last year. For the Clinton Foundation, the gala will hopefully be a turnaround, after the charity underwent intense scrutiny during the 2016 campaign, when Hillary Clinton was running for president. The foundation was criticized for taking millions from foreign countries, and on the campaign trail, Hillary Clinton faced questions about the pay-to-play allegations surrounding the family charity. The former secretary of state was accused of giving Clinton Foundation donors special access to the State Department during her tenure there. Critics also accused the foundation of mainly serving as a tool to boost liberal causes and the Clintons' prestige. The Clinton Foundation's work largely benefits impoverished areas in Africa and the fight against HIV/AIDS. This entry was posted in Politics and tagged Bill Clinton, Chelsea Clinton, Clinton Foundation, Hillary Clinton. Bookmark the permalink.